WELCOME TO THE NEW NHC! New Customer? Create an account. Ships tomorrow if you order in the next 21 hours 47 minutes. Sign-up to be notified when this product is in stock again. Auto Ship & Earn + 100 Points What's this? 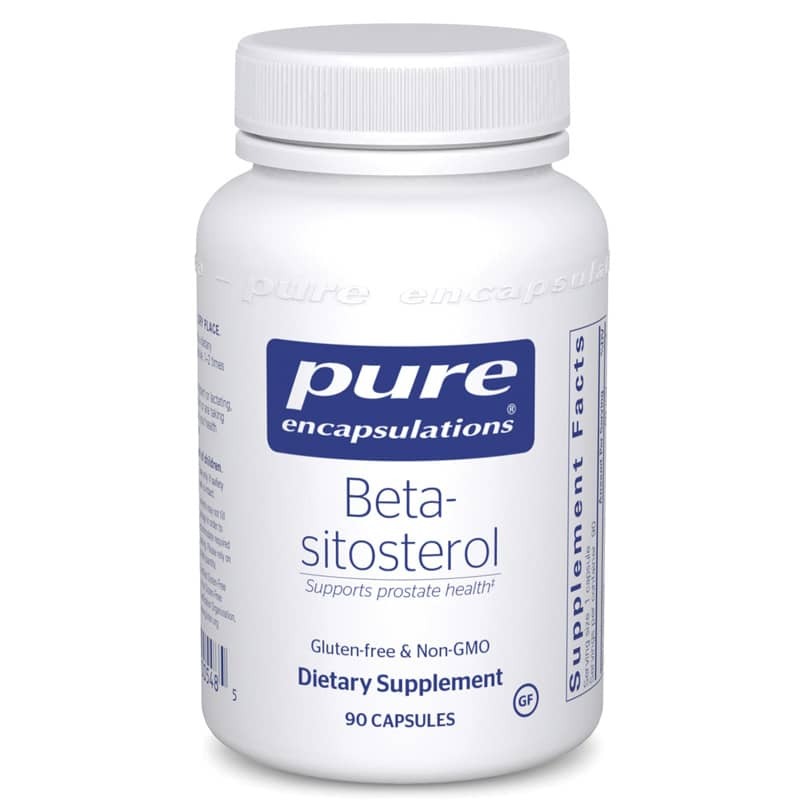 *Beta-sitosterol naturally occurs as part of a phytosterol complex and has indicated the potential to support prostate health. In a 6-month randomized, double-blind, placebo- controlled, multicenter study with 200 male subjects, it was proposed that a mixed phytosterol complex providing beta-sitosterol supported healthy urinary flow. In an 18- month follow-up trial, beta-sitosterol maintained healthy urinary function. These results have been supported in other clinical trials as well. Beta-sitosterol, derived from a soy-based phytosterol complex, may provide important support for prostate health. Other Ingredients: hypoallergenic plant fiber (cellulose) vegetarian capsule (cellulose, water). Contains NO: artificial additives, allergens, environmental contaminants, GMOs or added excipients. Adults: As a dietary supplement, take 1 to 2 capsules per day, in divided doses, with meals. This product may not be desirable for individuals with a sensitivity to soy. If pregnant or lactating, consult your physician before taking this product. I am very pleased with the benefits of this product. I have had only good experience with it's use. I am very pleased with the quality of the product, and I would recommend it to anyone. Pure is the best place to find the best products at the best prices. "I've been buying Probiotics from Natural Healthy for the past 3 years. I've been very pleased with all my purchases. Great customer service also!" "Natural Healthy Concept products are amazing! Everything I have ordered had arrived on time and exactly as I wanted!" "I couldn't be more pleased with the prices and excellent service provided. I have always received the right products and delivery is fast. So much easier (and cheaper) than going to my doctors office." This product is a temperature-sensitive item and is kept refrigerated. When you order a refrigerated item, we offer a variety of options to help keep your purchase cool longer during shipping. To avoid the risk of having this sensitive item stuck somewhere over a weekend, it will be shipped on a Monday or Tuesday. Choose an expedited shipping option with included cooler and ice pack if it's very important to you that your refrigerated item gets to you still cool or if you would like it shipped anytime during the week instead of just a Monday or Tuesday. You may also purchase an add-on ice pack to be included in your shipment from the cart page during checkout. Staying healthy just got easier and more rewarding. Get what you need from Natural Healthy Concepts exactly when you need it and earn bonus rewards points. Use Auto Ship & Earn to save time and money and never be without the vitamins, supplements or other health products that are part of your daily routine. Use the dropdown menu on each product page or in your cart to choose how often you want an item delivered with Auto Ship. We'll send you friendly reminders before each one ships to let you know it's on its way and to give you time to easily adjust delivery scheduling or timing in your account. NOTE: Please leave out specific health conditions or diseases so we can publish your review in compliance with FDA rules. Thank you! The email address associated with your NHC account is required for rewards points credit. We will only use your email to notify you in regards to your submission. Thank you for your product review! Please allow time for us to moderate your review. Live chat with representatives when available. We will respond to every email as quickly as we can. Find answers to your questions online anytime.